I got this recipe from a vegetarian cookbook. It is so absolutely aromatic- it instantly became a favorite and an annual winter meal. I usually only make it once a year- the dumplings are kind of heavy, but the flavor is so wonderful and warming. Perfect on a winter day. Corny, but true. Plus it uses a lot of ingredients I don't normally eat and I like that- fennel bulb and rutabaga, in addition to lima beans. I'd love to hear healthier suggestions for the dumplings if anyone ever modifies the recipe. 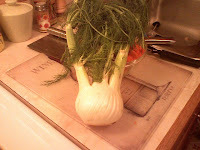 Fennel bulb if you didn't know smells like licorice. 1 cinnamon stick- this makes the BEST smell!! 1) cut all the vegetables into even, bite-size chunks. Don't kill yourself on the rutabaga- it's very tough to get the peel off so cut carefully, but don't feel guilty about being a little wasteful and removing too much with the peel. Fry the veggies gently in the butter for about 10 minutes. You could certainly use less butter! 2) Stir in the flour then the liquid from the beans, the stock, tomato paste, spices, bay leaves and seasoning. Bring to a boil, stirring all the time. 3) Cover and simmer for 10 minutes, then add the beans and cook for a further 5 minutes. 4) Meanwhile, to make the dumplings, shred one stick of butter and mix with the flour, thyme, and salt to a firm but moist dough with the milk and knead with your hands until it's smooth. 5) Divide the dough into about 12 (you might get more) smallish pieces, rolling each one into a ball with your fingers. Uncover the simmering stew and then add the dumplings, allowing space between each one for expansion. 6) Replace the lid and cook on a gentle simmer for a further 15 minutes, though test a dumpling first to make sure it's ready before you take it off the heat entirely. Don't peek as it's cooking, you'll let out all the steam and mess everything up! 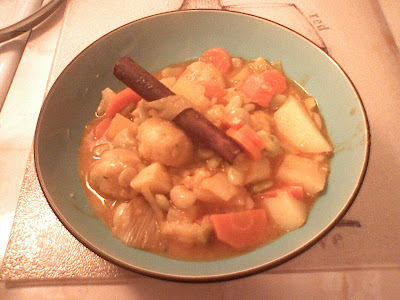 Remove the cinnamon stick and bay leaves before you serve this dish, steaming hot.